Are You Wasting These 7 Vegetables? For the longest time, I’ve dreamed about buying a little farm. I can see it in my mind so clearly. There will be an olive grove, a little vineyard, an orchard of nut trees and another of citrus. And pride of place will go to a big walled veggie garden. We’ll have chickens of course. And maybe my Irishman will even get into some bee keeping. I can’t wait! The plan is to buy a place next year but luckily I have my little veggie patch here to play with in the meantime. Since I’ve been growing some of my own veggies, I’ve been really interested in eating as much of the plant as possible. I hate throwing food away at any time, but when it’s something you’ve nurtured from tiny seeds, the urge not to waste is even stronger. This has made me realize just how much edible food I used to throw away because I didn’t think to eat it. So today I wanted to share my favourite edible discoveries. And if you have any others I’d love to hear about it in the comments! You know when you buy baby carrots, there’s no need to waste the lovely leaves! Because they look like flat leaf parsley and taste pleasantly ‘green’, you can use them most places you’d use leafy herbs. Baby leaves are great served raw in salads but once the leaves get larger I find they need cooking to soften the texture and flavour. I usually chop the stems finely so they’ll cook faster. My favourite method is to wash the leaves and stems and chop. Then pan fry in a little oil with some garlic just until everything is tender. I either keep the stalks to cook separately or I chop and sauté them in oil with a little garlic until they’re almost tender and then add the leaves. Mostly when I’m cooking broccoli or cauliflower I finely slice the stems and just treat them the same as the florettes. Sometimes you can buy broccoli with tiny leaves attached. I just treat these the same as the rest of the head. But if you’re growing your own you’ll have access to the mature leaves. I treat them the same as I would kale. I was very late planting my broad beans this year so I doubt we’ll get any actual beans. But it won’t be the end of the world because we’ll still have some broad bean leaves. They have a super fresh broad bean flavour that I adore. The texture can be a little limp though so I generally don’t use them alone in salads but will mix with other leaves. They are lovely cooked in a pan until just wilted with a little garlic, oil and a splash of water. There aren’t many vegetables I bother to peel, apart from broad beans and sweet corn. Basically because I’m lazy but I tell myself it’s because much of the flavour and nutrition is in or just under the skins. My Irishman and I once did a taste test of potatoes roasted with and without skins. The unpeeled ones were just bursting with potato flavour and we haven’t looked back! I also love roasting pumpkin or butternut squash with the skins on and then eating the skin. So good as long as they’re well cooked! Inspired by the very good looking boys from Three Blue Ducks in Bronte. Love their new cookbook which my Irishman gave me for my birthday. 1. Whizz carrot tops, parsley, garlic and nuts in a food processor until finely chopped. 2. With the motor running pour in the oil. Stir in parmesan. Taste and season if needed. different herbs – feel free to play around. Basil, mint and coriander (cilantro) are all excellent additions or replacements. budget / different nuts – I often use cashews instead of pine nuts. Almonds are also lovely in pesto. garlic-free – replace that garlicky sharpness with a squeeze of lemon. vegan / dairy-free – replace the parmesan with extra pine nuts or other nuts. Since the arrival of Fergal, I’m a big fan of meals you can just pop in the oven to cook while you do the laundry or catch up on emails. 2. Place chicken, carrots and garlic in a roasting pan. Drizzle with some oil and sea salt. 3. Roast for 25-30 minutes or until the chicken is no longer pink. 4. Serve hot with pesto on top. 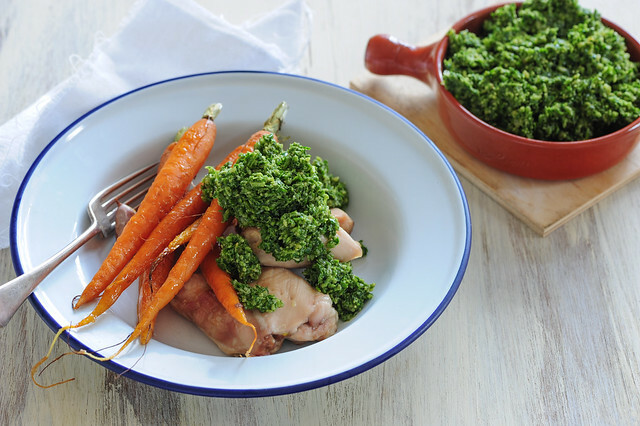 short on time – use a commercial pesto instead. can’t find baby carrots? – use regular carrots and chop them in half lengthwise so they cook in the same amount of time. different meat – you can use chicken breasts, drumsticks or thighs on the bone. Duck would be lovely as would lamb chops or sausages. You’ll just need to adjust the cooking time. vegan – roast large field mushrooms instead of the chicken and use the dairy-free pesto version. 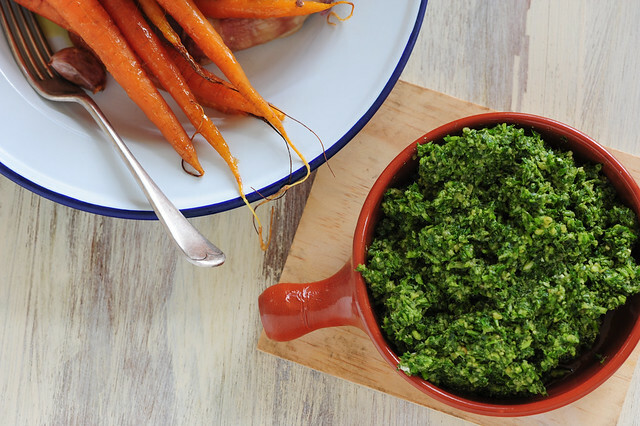 vegetarian – roast the carrots and garlic and serve with the pesto and a fried or poached egg. Call me crazy but I actually like broccoli stems more than I like the florets themselves. They are great eaten raw! I also like the broccoli stems raw!! I just trim them a little if they are dried out. The stems when cooked usually take longer then the florets so they are too hard. Carrot Tops make the best dye esp with copper,they then go in the compost. Most of the leaves go to feed the chickens and the peelings can either be used for the dogs cooked veg (he loves asparagus ends) or saved up in a bag in the freezer for making stock. And sometimes the broc/cauli stalks go in the pot and sometimes they are cooks treat. Thank you very much for sharing this recipe. I will definitely try this because I love working out. I believe that I also need to eat healthy foods in order to be fit and healthy. Glad that I have found this post. Outstanding resource in this one! I also often think we are far too inattentive to what’s right in front of us when we’re cooking. Thanks for your suggestions, insights and recipes. I enjoy your approach all through. I’ve always eaten broccoli stems and leaves as well as chard stems, and never peel things like potatoes (I have generally peeled carrots I bought because I didn’t like what the peel did to the flavor). Wish I could have a veggie garden again, but unfortunately we are never home during the growing season. I really like the idea of using carrot tops – they should taste pretty much like parsley. Thank you for getting me thinking again about how to use things I might otherwise waste. Where I live (in central France) it is the green leaf of chard that is not eaten. Normally I can buy chard at the market with leaf and all, but the other day I noticed that the leaves had been cut off roughly and it was just the stems for sale. Personally I think the leaf is the best bit and the stems are rather dull, requiring a seriously cheesey sauce or something. The palate here is very subtle, so for example white asparagus and celery (blanched by earthing up) are favoured over green, and very little spice or even garlic is used. I expect that’s why no one eats the green bits of chard — too strong a flavour compared to the stems. I also keep lots of the things you’ve mentioned (and others have mentioned trimming off) in the freezer and then when I’m making a big pot of stock just throw them in. Especially if something got missed in the veggie crisper and is just a little to gone to salvage – into the freezer, then into the stock pot! Something that I learned a little while back is that if you don’t want to eat the peels–say you’re making mashed potatoes, for example–you can still save them. Just take a gallon ziploc bag and fill with peels from different meals until it’s full. Keep it stored in a freezer to avoid spoilage while you wait for it to fill. I only recently heard about being able to eat beet greens, and it blew my mind. Very cool to hear about these other edibles! I used to work at farmers’ market for our university’s small organic farm. Sometimes a customer would ask me to cut the leaves of a bunch of beets and I’d refuse, explaining that beets and chard are variations of same vegetable (beta vulgaris), and all the leaves all edible. Often the customer already had a bunch of chard in their basket, so eating all the beta vulgaris leaves together made sense. Once or twice, the customer responded, “well then, cut the leaves off and sell them as chard!” “Fine, I will!” And I did. But broad bean leaves are a new edible leaf to me! Thank you for sharing!